Change timestamps for certain files! 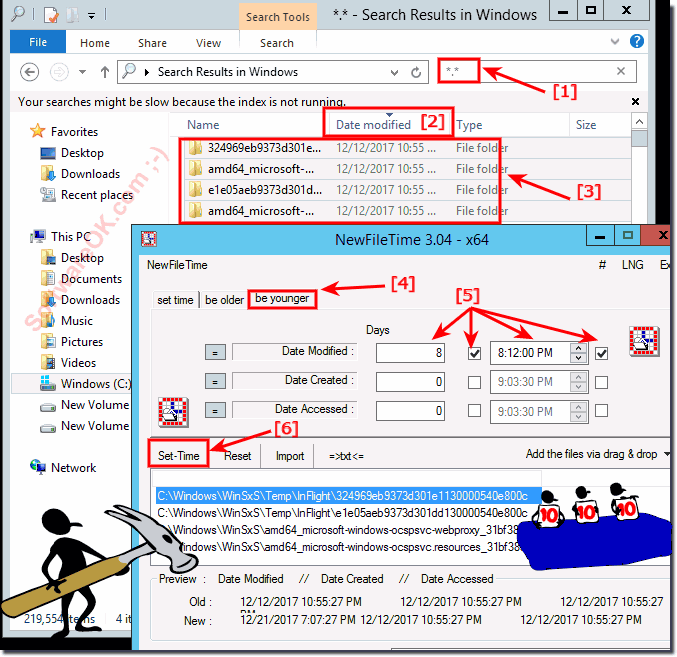 Here is an example of how to easily change certain file timestamps, suitable for all Windows operating systems! Suppose I want all the files and folders in a particular directory (part) tree whose last-modified date is between 07/12/2017 17:53 and 12/12/2017 14:44 so change that to the last-modified and creation date respectively exactly 4 days, 8 hours and 12 minutes is added. 1. For example, start the MS Explorer and open the respective folder. 4. Now you can easily select the data and drag and drop it to NewFileTime. Please: ... use always the latest version of NewFileTime for Windows! (Image-1) Change timestamps for certain files and folders! NewFileTime - FAQ-9: Change timestamps for certain files! The solution is quite simple to use the timestamp of a particular Windows file or folder / directory File timestamp from file. I wonder about the function of 'Text to time tester'!